"You have your fear, which could become reality...and you have Godzilla, which is reality"
"saw" it.... anyway, expect not much in the way of new posts for awhile, enjoy the archives, lots of stuff when I get back from the land of Godzilla. Back to another rocket. I do like doing them. 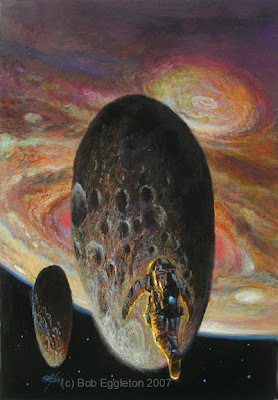 This one, again is for display at the Japanese World SF Con, for which I leave for this week. Be ready for posts to be kind of really slow...in fact, maybe a break for a bit. I'll probably be back to paintings-a-day in the Fall sometime. It has been one VERY busy summer, and as I said, this is my painting AND project blog...and the projects lately have been many! A couple of in-progress works, both covers. 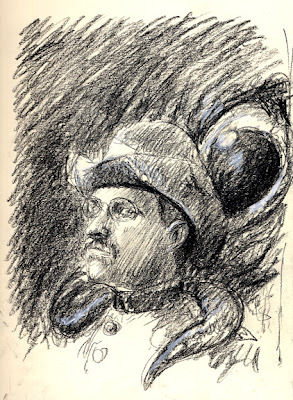 Top is for a Mike Resnick collection, and this particular one shows Teddy Roosevelt with an H.G. Wells martian. 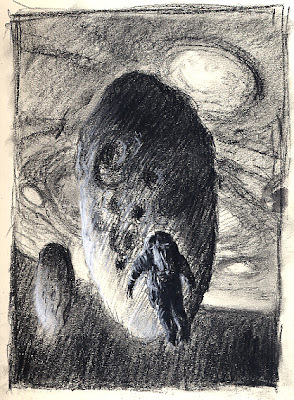 The idea is to do it much as an old portrait kind of thing.The bottom is for a new publisher and a Gene Wolfe book that deals with huge tombs in space, around Jupiter, made from asteroids. 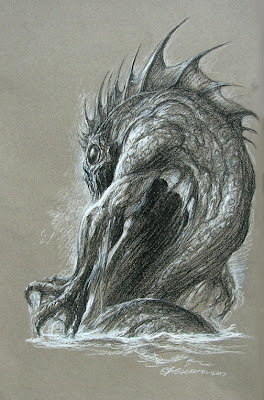 The idea was to convey a sense of mystery and not give too much away. Yes, I am bringing this guy to Japan soon. Fun little piece that captures the mood of the 1954 classic film(see it on DVD in the way it is supposed to be seen without Raymond Burr!!). 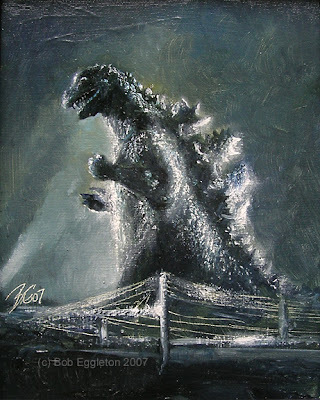 My first Godzilla in oils!!! It's supposed to be, in Rhode Island "Victory over Japan Day". The only state in the nation that still "celebrates" it, if you will. Why I will never know. A good excuse for state workers and politicians to get the day off? Perhaps. 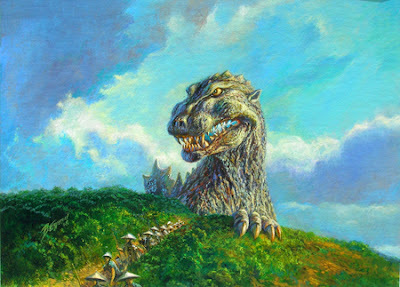 So here's a little perspective on it, my perspective.... with fiery breath...back at the "holiday"...Gojira!!!! What you see here, is part of a matte shot I did for a film, THE iDOL, shot in Japan, directed and written by my very good friend Norman England. Norman is a writer for FANGORIA magazine,doing excellent interviews and articles about Japanese horror films, Godzilla, etc. He then decided to make his own film on a shoestring budget, and, asked his friends to help out. 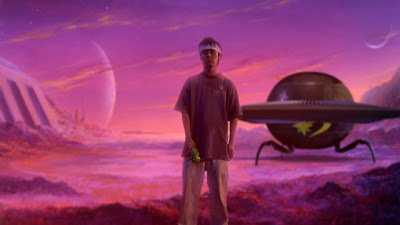 I did some conceptualization of several scenes and, in the end, this "pink planet" matte painting. The actor, is real, but the flying saucer is a CG generated element that looks incredible when moving, and the background is my painting. 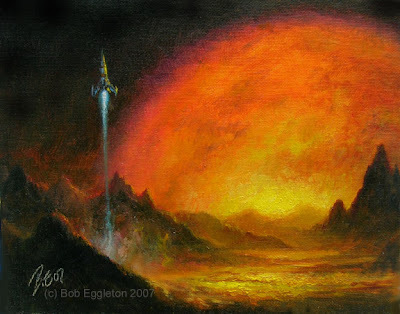 I had specific directions to pay homage to that end shot Chesley Bonestell did in WHEN WORLDS COLLIDE. This is a slightly unfinished test shot, but you get the idea. I'm doing more work with Norman on his next project as well. That is really exciting so far, so stay tuned. 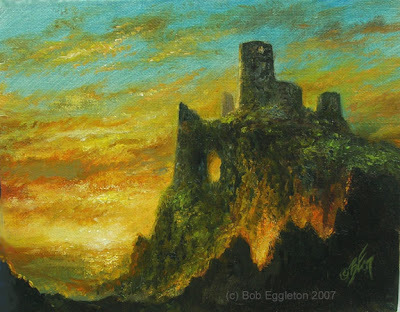 The Glowing(8x10, oils, SOLD!) The evenings have grown noticably shorter. I like longer days. That nice, subtle glow that forms on the horizon about 8-8:30pm depending on where you are. Once again, a painting for the Nippon artshow. Well, flight...but not just yet. This painting IS going to Japan. If it doesn't sell, no worries it will be here for sale. Again, my fixation with clouds and light through a dragon's wings. 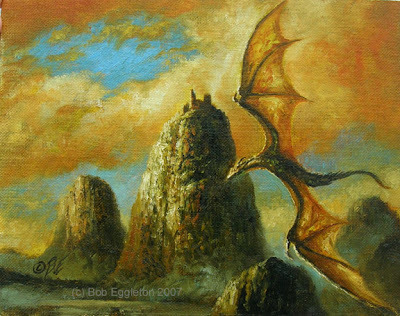 I liked the shape of this dragon most of any I have done along these lines, and the clouds came out particularly nice. All in all....fun. 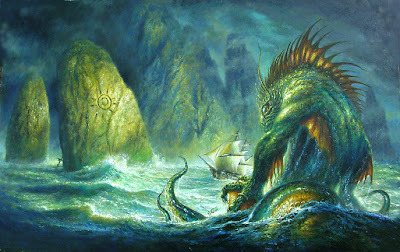 I'm planning on making a LARGE painting like this someday using these paintings as a guide. COOOOOOL! Or...Kewl...however it's said these days! Nothing like The Moody Blues!!! A quick movie plug. 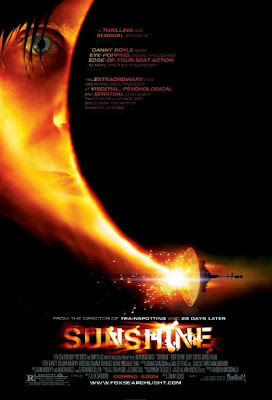 I saw SUNSHINE, the new film by Danny Boyle(28 Days Later, Trainspotting) that may be one of the best "hard" SF pictures I have seen in a long time. They don't make 'em like this much in a vast sea of fantasy films(not that there is anything wrong with that, but good hard SF is vastly ignored these days). Essentially-the theory is that a "Q-ball" of dark matter has destabilized the sun(it's a theory by one of the science advisors to the film) causing the sun to become weak and thus, earth starts to freeze(not much time is spent on this, it's backstory). The spaceship Icarus 2 is headed toward the sun with a massive "solar bomb" designed to act like a small "Big Bang" and disperse the dark matter and re-ignite the sun. From an acting, and character point of view, this is one of the best casts I have seen-multinational, and it shows that even in space, on a vast ship with all the comforts of home, the effects of confinement and isolation take their toll in subtle and eventually dangerous ways. The CG visual effects-particularly the Icarus ship- are stunning and, while dazzling, they never take away from the characters who, from the get-go, you feel like you know personally. No spoilers, only to say, go see this one while it's still in a mere 400 theaters in the US. It's getting great reviews and, there hasn't been anything quite like it in a long time. It pays homage to both Stanley Kubrick's 2001 and, Ridley Scott's ALIEN film in places and in overall tone but only to logical ends. But that works for the good in this case. I saw it twice it left me with such images and resonance. The film stars Cillian Murphy, Rose Byrne, Chris Evans, Michelle Yeoh, Hiroyuki Sanda, Cliff Curtis and Benedict Wong.